At this hospital in Stockholm, Sweden, patients with arthritis have to fill in a questionnaire before their appointment with their physician. The patients answer a number of questions about joint pain and stiffness. Earlier, the questionnaire was a bundle of paper. Now it’s digital – on those very computers in the waiting room. (That questionnaire was the software Henrik Ahlén, veteran digital consultant, was working with now.) The big advantage of digital is that the data is entered directly into the patient’s Electronic Health Record, which saves a lot of time. When the patient meets her doctor, he already has a summary of the results on his screen, and they can discuss the best treatment. Well, when patients are ready, they’re supposed to press a ”Save” button on the screen. But a lot of them instead press the Windows’ ”Close” icon in the upper right corner (perhaps they were determined not to let the next person see their entries). But this also shut down the machine, and the data they had entered were lost! Solution: cover the icon with a piece of paper or tape! Just let me give you two conclusions here. What’s this: I’m a Swedish UX designer and writer, specializing in systems used in the workplace. This blog is about my most recent book, covering how such badly designed systems are a major cause of stress (and eventually even health problems). You can read a bit more about it in English here. I tweet as @jonas_blind_hen (in English and in Swedish, mixed). Oh, and if you’re around, I’ll give a talk at Euro IA Summit in Rome next weekend (September 28-29, 2012) about ”Stupid bloody system! – Bad IA in the workplace, the causes of stress, and the rise of bureaucracy 2.0”. Hi nice examples of badly designed software. It also shows how many ideas going out to customers can give you. As a nice anecdote, I have tried to apply for a patent a couple of years ago for a small USB stick that mimics a moving mouse, to prevent computers from locking up :-). It wasn’t deemed new enough but your story does show the value of such a solution. Better yet Microsoft should improve their software. 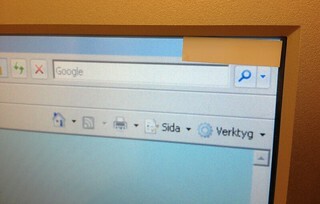 they should run chrome/IE in kiosk mode, instead of taping the close button! your point still stands: Real testing, with real people should’ve reavealed this. barbs comments on "What's the waiter doing with the computer screen? (2012)"